The park, located on 6th Street, was named the Liz McCafferty Memorial Park in memory of Elizabeth (Jany) McCafferty, a popular high school teacher from the community. Members of the community donated their time and energy into making sure that the equipment would be everlasting and forever enjoyable for all residents and visitors to Smooth Rock Falls. During the summer, the street between the Park and the public pool is closed to traffic so kids and families can enjoy the facilities safely. 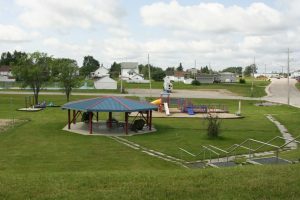 Kelly Park is located on Highway 11, and has a boat launch for municipal use. When you are heading west on Highway 11, turn left at the side street just before the bridge to access the boat launch. This park is perfect for a picnic with lots of parking, green space for the kids to run around and a few picnic tables. The view of the Mattagami River and Smooth Rock Falls’ iconic bridge is amazing and you can even fish off the shore!